Gold futures rose modestly in their start to the new trading week on Monday, marking a fresh, almost two-year high, while silver declined for the first time in five sessions. Gold for August delivery edged up $2.30, or 0.2%, to settle at $1,324.70 an ounce on the Comex division of the New York Mercantile Exchange. The settlement is the highest since July 11, 2014 when prices closed at $1,337.40 an ounce. "I’m bullish gold because now with Britain leaving [the European Union] there could be danger of the whole euro zone having more political issues," Bloomberg News quoted Miguel Perez-Santalla, a sales and marketing manager at Heraeus Metals New York LLC. "People are going to want to stay hedged with gold; they didn’t think the Brexit was possible, and then it happened." Gold futures ranged from a low of $1,322.20 to a high of $1,340. They rose 2.1% last week for their fourth straight weekly increase. Elsewhere, silver for July delivery dipped 4.5 cents, or 0.3%, to settle at $17.744 an ounce. Silver futures traded between $17.66 and $17.94. They advanced 2.2% last week, which also marked their fourth weekly gain in a row. On Friday, silver surged 2.5% and settled at its best price since April 29. 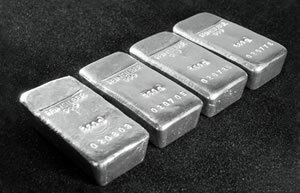 July platinum fell $7.90, or 0.8%, to $979.20 an ounce, ranging from $976.90 to $997. Palladium for September delivery added $10.95, or 2%, to $557.40 an ounce, trading between $545.85 and $558.35. Last week the two metals logged gains of 2.2% and 3.2%. Gold rose $9.05, or 0.7%, to $1,324.55 an ounce. Silver declined 34 cents, or 1.9%, to $17.70 an ounce. Last week, London bullion prices advanced by 1.9% for gold, 3.9% for silver, 2% for platinum and 3.2% for palladium. United States Mint bullion sales were unchanged Monday as of 3:14 p.m. Eastern Time. Earlier in the day, the U.S. Mint said its latest weekly allocation of American Silver Eagles is 2,837,500 coins. 2016 Silver Eagles are running at a record pace with sales of 25,312,500 coins, marking a 22.7% increase over those sold through same time in record-breaking year 2015. Speaking of household limits, the mint had a press release Friday (6/24) stating there was a household limit of one (1) coin for Nancy. Thanks for reminding me about our previous posts about Nancy’s gold coins household limits. I found out that the Mint’s press release should have stated a limit of 1 Proof coin & 1 Uncirculated coin per household. Their release of 6/24 was specific that it was one coin only per household. You must have cleared that up with someone (after the 6/24 release); but, guess they will still have an “out” to reject someone’s order who orders one of each if they want to. Did seem strange that there are two products and you could only buy one; but then again they seem to do strange things and different people do different things. Thanks for your information which I will take as true. Perhaps the mint could (they should) issue a “correction” so people will know. Will not hold my breath for that thou. You sure are right about that press release being basically incorrect on the household limit. As you noted, each version is sold separately as either Proof or Uncirculated with different item numbers. The total mintage of 15,000 coins is across both options & the ratio will be based on sales results. But you can buy 1 of each coin in Proof & Uncirculated & that is exactly what I plan on doing. Can’t wait to see them in person! Good luck. The other interesting thing is that for this series they always say the ratio is based on sales results which is never the case. Jackie’s proof sold out long ago but unc. still available and no where near limit. One would have to believe too the total limit might have already been struck for Nancy.